Billabong Pro Tahiti, Stop No. 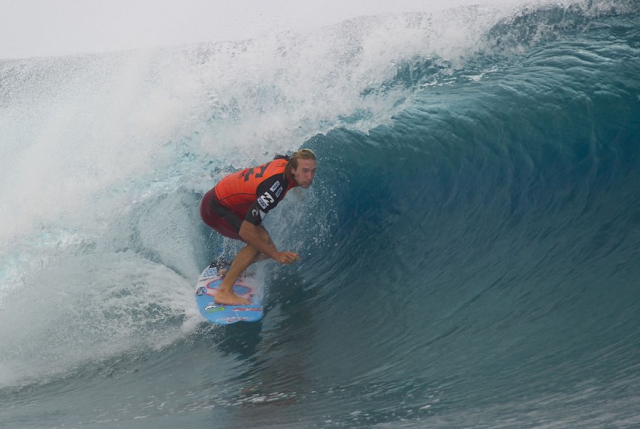 5 of 10 on the 2012 ASP World Championship Tour runs August 16th – 27th at Teahupo’o. Adam Melling will surf round 1 vs Gabriel Medina and local bloke Michel Bourez in Ht 11. Last years runner up Owen Wright will surf round 1 vs Alejo Muniz and Yadin Nicol in Ht 9. Good luck fellas. Surfline forecast - Moderate size, long period and inconsistent Southwest swell will prevail for the first two days of the waiting period, along with local short period south windswell. Another moderate, mid periodsouth swell will fill in for the weekend, before backing down early next week. At this point, the long range forecast looks very slow with no swells of significance on the radar for Teahupoo for the last week of the waiting period. Owen surfed a smart heat building a foundation early on with a couple of smaller waves. The sets never arrived during the heat so Owen took the win and moved into round 3. Mello couldn't find the good waves and surfs next in round 2. Mello was sent out in the worst conditions of the event so far and couldn't buy a decent wave and so he was eliminated. Owen dusted Pupo in a round 3 barrel shootout. In round 4 he had one excellent ride but only backed it up with a 6.17 and finished 2nd. He surfs next in round 5 vs Julian Wilson. Owen got pitted off his nut and smashed JDub in round 5. In his quarter vs Ceej Owen won easily with a 18.90 total with more amazing tubes. Owen scored another 18+ heat score with plenty of sick pits but fell just short of Mick and finished the event in 3rd. Well done Owen.